Sugar, Vinegar, Salt, Spices, Turmeric and Polysorbate 80. From Paul F of Schererville, Indiana on 11/17/2018 . Amazingly fresh flavor, high quality product. From Paul Fotia of Schererville, Indiana on 11/15/2018 . Amazing great flavor and delivery speed. From William Solomon of Pontiac, Michigan on 8/24/2017 . THIS IS MY SECOND ORDER OF THE SWEET SLICED GREEN TOMATOES. THEY TASTE GOOD ON MY COOKED VEGETABLES LIKE GREENS AND BEANS. I WILL BE REORDERING MORE ONCE THESE ARE GONE. From arnwrker of salem, Arkansas on 8/10/2017 . From SusanM of Senatobia, Mississippi on 6/8/2017 . 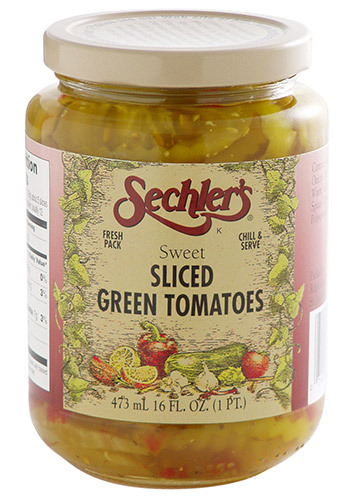 These are the best pickled green tomatoes you will ever eat!! We were buying a different brand but on a whim decided to try these after seeing them in a grocery store while on vacation in Mt.View Ar and love the taste of these better so when we came home we couldn't find them anywhere so ordered them online and received them within a week. You won't be disappointed in these.